Released on March 23rd 2016 from Iceberg Records on Vinyl / CD. Also available as download from I-Tunes, Amazon and Google Play. 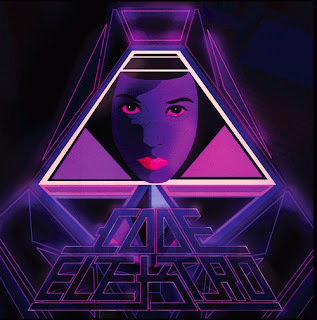 Formed in 2012, the Danish band Code Elektro are the brain child of composer / sound-designer / producer Martin Ahm, whose background includes substantial commercial experience with brands such as Fanta and MTV. “Superstrings” is the band’s debut album, and richly reflects the sci-fi / cyberpunk obsessions of its creator, alongside the prominent influence of key artists and bands such as John Carpenter, Vangelis, Daft Punk, Tangerine Dream and M83. It’s a mesmerizing meld of digital and analog synths and taps into the ongoing 21st trend for evocative atmospheric music infused by the beloved scores of classic genre movies of the 1970’s and 1980’s. The driving, pulsing opener “Cyber Dreams” sets the tone with a sense of building excitement invaded by a hint of underlying menace. It resembles the end title music for BLADE RUNNER but establishes the band’s own distinctive sound. “Her Desher” is among the more overtly sinister tracks, while “Binary Prophecy” is a slow-burn built upon a quietly beautiful melody that remains persistent even as everything around it becomes more oppressively dramatic. Meanwhile, album highlight “Death Star” is marvelously melodramatic and ominous, incorporating the kind of malevolent choir Jerry Goldsmith employed so memorably throughout his career, and notably within THE OMEN scores. If these legendary composers and musicians of past and present float your boat, there really is no other sensible option than going to www.codeelektro.com and buying the lovely vinyl version, which best represents the charmingly retro artwork by Kilian Eng. It also has a download code for all those whipper-snappers out there. If you want to pick up a copy of the album then go here http://www.codeelektro.com/ and support the artist.